If your thrill meter is running on empty, our Arrive and Drive sessions are the perfect solution. Our open racing Arrive and Drive sessions let you drive flat-out with up to 10 other drivers and are available to the public 7 days per week. You'll come in and suit up, receive a driver briefing, then hit the track. Individual races can be purchased, and race prices get cheaper as you go! The latest in high performance racing is here! The SODI RTX features a 20Hp DC electric motor delivering instant acceleration and incredible throttle control for drivers of any skill level. With an integral side protection system, adjustable seat and pedals, the RTX offers every guest a safe and comfortable race experience. - 100% electric power - No fumes - Pleasing, high performance sound - Remote speed control for a consistent & safe operation. Our state of the art track and karts combine for the best racing experience. First time racers and experienced kart drivers alike will feel challenged and exhilarated. Advanced safety barriers line an exciting track designed after some of Ohio’s best race circuits. The racing is tracked down to the 1/1000th of a second with an integrated timing and scoring system giving racers immediate feedback on their performance. At BOSS Pro-Karting, we're bringing the thrills of competitive driving and pure speed to everyone in NE Ohio. It starts with our premium, high-technology karts and a professionally designed track with fast turns and chicanes. Safety always comes first and our experienced staff will show you how BOSS Pro-Karting brings a unforgettable racing experience to all our racers. At BOSS Pro-Karting our high-speed karts and thrilling experience leaves you wanting more. Good news! The more you race, the cheaper it is! Our multiple race packages are the perfect option for you. Worried that you won't use all races in one visit? Race purchases will be saved with the Annual License, good for up to one year. Having a parent or legal guardian present with you at BPK to sign the release when you register with us for your first race. Registering online where your parent can sign the waiver digitally. Then just head to the track and we'll have it on file! 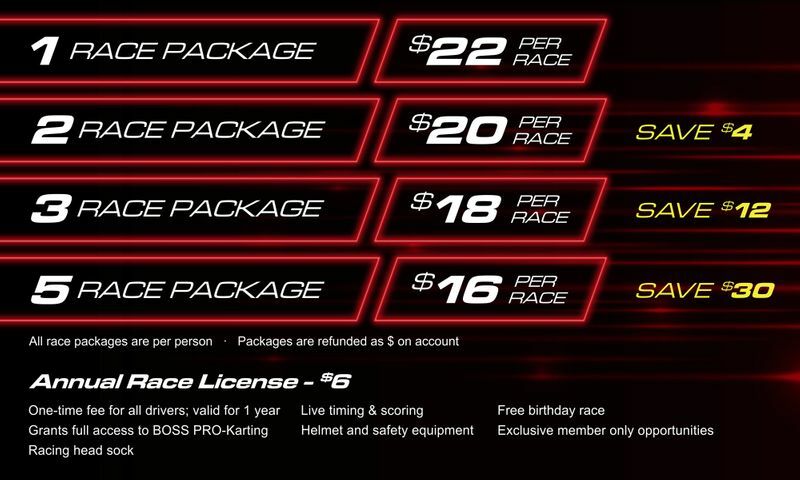 $6 - Mobile App Membership: includes full access to BOSS Pro-Karting including a full suite of features in our mobile app for Apple and Android devices.